Having worked on a large number of mobile applications I am well aware of the complexity introduced by having to deal with multiple asynchronous event sources. To that end I have been experimenting recently with the use of Reactive Extensions on both iOS and Android, using ReactiveCocoa and RxJava respectively. Android developers who have followed a similar path will be familiar with the name Matthias Kappler, a core contributor to and proponent of RxAndroid. Matthias recently kindly agreed to a Q&A session with myself for InfoQ, an extract of which is included below, along with a link to the full article. InfoQ: Why should Android developers who are comfortable with AsyncTask or Loaders invest time in learning RxJava? Matthias Käppler: We adopted RxJava because there are limitations to AsyncTask, Loaders, and Handler/Message which made them unsuitable for us as a means of transporting data in a resilient and reusable way. The primary reason is their lack of compositional APIs, which prevented us from expressing asynchronous operations as what they typically are: a sequence of steps where inputs and outputs are handed over from one step to the next. Closely related to this is the idea of performing such steps in a fault tolerant way, however, none of the above mentioned framework classes can express the fact that even an individual step failed, let alone an entire sequence. Since we frequently need to compose multiple data sources such as database and web API calls, and since furthermore mobile is an environment that is inherently prone to failure of many kinds (flaky networks, device fragmentation, etc.,) AsyncTask, Loaders, or Handler/Message alone can not be considered suitable tools. RxJava addresses this by providing a uniform way to describe a piece of work to be executed, how to transform or compose its result, all the while making sure that either result or failure end up safely at the subscriber, no matter if or where the sequence failed. Last week I published my first InfoQ news article covering the preview release of Microsoft’s 2.0 Mobile Services SDK for iOS. A blurb of the article is included below along with a link to the full piece. Under the Bash! brand we at Instil regurarly gather the local software development community for talks, workshops and discussions on all matters of software development, ranging from functional programming to DevOps. This summer saw the first Bash! Summer of Code, a series of 10 weekly workshops running throughout July and August covering topics such as Scala, Gradle, Clojure, React.JS and Java 8. As part of the series I was lucky enough to be given the opportunity to deliver an introductory iOS development workshop. The workshop was delivered on two separate occassions, firstly to the Women Who Code Belfast group and secondly as an open event. The focus of the workshop was getting attendees to follow along in the development of a small game named SpeedTap. The SpeedTap game tests a user’s ability to start and stop a timer after 5 seconds – a simple reaction time test. This was a surprisingly fun little app to build and offered a chance to introduce some key conepts including StoryBoards, Model-View-Controller, UIViewController, properties and Key-Value-Observation. Given that attendees had, on the most part, no prior Objective-C or Cocoa experience it was great to see everyone leaving having built their first app. Slides for the workshop are available on Scribd and the SpeedTap source code is available on Github. Blog post from Women Who Code discussing the session. UIAutomation was introduced in iOS 4.0 and relies on multi-tasking support in the OS. Rather than alter your app executable UIAutomation runs as an external process – sending UI events to your application as it executes. How does it interact with on-screen elements? UIAutomation exposes a number of helper objects and functions to test scripts that enable interaction with on-screen elements. Using these functions we can reference on-screen elements and simulate interactions with them – i.e. tapping buttons or table view cells. Referencing of on-screen elements is made possible by the UI Accessibility programming interface, an API traditionally used to help visually impaired users access applications using VoiceOver. By adding accessibility information to your app’s interface elements VoiceOver can read the contents of the screen. Accessibility information can be added to an element both programmatically and via Interface Builder. To make a UIElement accessible programmatically you will need to call setAccessibilityLabel: on the UI element e.g. Whilst we are discussing accessibility in the context of enabling automated testing it is important to remember VoiceOver users will rely on these labels to use your app. You should therefore ensure that all elements are appropriately labelled. The most comprehensive reference for appropriately providing accessibility information is Apple’s Accessibility Programming Guide for iOS (requires an Apple iOS Developer Program Membership to view). A UIATarget occurs as the root of hierarchy and represents the host device running the application. The UIATarget has a single child element of type UIApplication which provides access to application level UI elements i.e. the main window, status bar, tab bar etc. Below the UIAWindow is a tree of UIAElement objects representing the on-screen UI elements belonging to the app’s single view. Whilst UIAElement is the root type of all items referenced via UIAutomation, each UIKit class has an associated UIAElement subclass i.e. UILabels are represented by instances of UIAStaticText. This ensures that behaviours specific to each control type can be accessed via UIAutomation i.e. a UIAButton can be tapped. We can use our new found knowledge of the accessibility element hierarchy to start writing UIAutomation tests. The first task of any test is to navigate the element hierarchy and obtain a reference to some on-screen element. Here we obtain a reference to the device under test, obtain the current app and get a reference to its main window (iOS apps will have only one). Now instead of referncing the username text field based on its on-screen position we are using its accessibility label. This not only removes the dependency on the ordering of the elements but also drastically improves the readability and maintainability of the test. One last thing to note about the username example above is the call to textFields() on the app’s main window. This method is one of the numerous selectors exposed by UIAElement (and its subclasses i.e. the UIAWindow returned by mainWindow()). These selector methods provide the mechanism for you to reference direct child elements of a UIAElement by type. So for each UI element type UIAElement will expose a selector method i.e. buttons(), tableViews(), textViews(), searchBars() and label(). As well as the methods exposed by UIAElement, each custom type will expose its own methods that describe appropriate interactions for the type of UI element being referenced. Take for example a UISlider, we could model interactions using the dragInsideWithOptions method but it makes more sense to use UIASlider’s dragToValue method. It is therefore important to refer to the class documentation for the UIAElement subclass to determine the ways in which you can interact with a particular element. We have so far covered the basic concepts required to write functional tests using UIAutomation. What we’re now going to do is to build on those concepts by writing tests for a ‘real’ application. In doing so we will see how to execute UIAutomation tests, gain exposure to some more advanced techniques for interacting with your application and learn to structure our tests. The application that we will use for this exercise is a simple task list. If you refer to the image to the left you will see that there isn’t a lot going on, we have a single UITAbleView with a single row per task. The user can add tasks by entering the title in the UITextField in the table header view, and can subsequently delete them using the swipe-to-delete mechanism. At this point you should obtain a copy of the MyTasks sample project source code from Github, the repository can be found here. Load the test script by selecting Add –> Import… from the left hand pane (Scripts section). In the new finder window navigate to the project directory, open the Functional Tests folder and select the TaskList Tests.js script. Switch the active pane from Trace Log to Script and hit the play button to begin execution of the tests. Once you begin executing the tests the active pane will immediately switch back to the ‘Trace Log’ where you will begin to see live output. As each test completes the test result will be displayed on a new line – where the ‘Log Type’ column will contain the outcome. To get more information about a particular test you can expand the test log (see below). Our first test is straightforward, we want to ensure that users can add a new task to the list. Breaking this down into UI interactions we can say that we would like the user to be able to tap on the new task title field, enter some text, tap the done key and have a new task appear in the list. The first line of the test is a function call to the test method provided by tuneup.js. For the purposes of the MyTasks app tuneup has been included to improve the structure of the UIAutomation tests – in particular the ability to split test suites into individual method calls to the test function. Referring back to the test implementation we can see that the test call takes two parameters, the first is a string which identifies the test and the second is a function which wraps the test logic. The function includes two parameters, the UIATarget and the UIAApplication which are injected by tuneup to provide the test logic access to the accessibility hierarchy. For now we wont discuss tuneup in any great detail, suffice to say it dramatically eases the development of UIAutomation test scripts and you should refer to the project documentation after reading this tutorial. // APP is a global variable which references the 'app' parameter passed to the tests by tuneup. // By storing the reference in a global variable we remove the need for each test to pass the 'app' parameter to this method. The addTaskWithTitle method takes a single parameter, the title of the task to be added to the list. 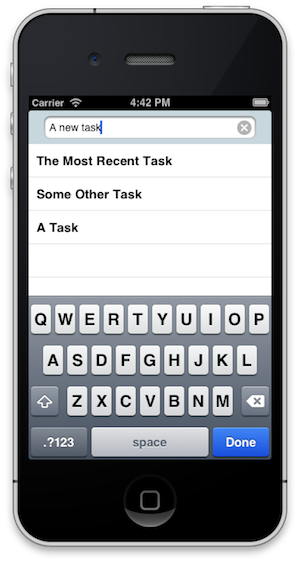 The first line navigates the accessibility hierarchy to find the UITextField with the accessibility label ‘New Task Title’ (the field contained in the header of the UITableView containing the tasks). The text field is then tapped to active the device keyboard. The field’s value is set to the title of the task being added. The keyboard’s ‘Done’ button is tapped – this dismisses the keyboard and triggers the task to be added to the list. The assertNotNull assertion method is one of a number of useful assertion methods included in tuneup which build upon UIAutomation’s UIALogger’s logPass and logFail methods. Whilst logPass and logFail are adequate, the tuneup assertions build useful abstractions atop of them, for a full list of the available consult the tuneup documentation. In this test we are asserting that the value returned by taskCellWithTitle is not null. Like addTaskWithTitle this is a helper method which allows re-use of behaviour common to numerous tests within the suite. A reference to the UITableView containing the tasks is obtained using the taskTable helper method. The array of the table view cells are obtained using UIATableView’s cells method. The array is searched for a cell with a name matching the task title (here the name of the cell will match its title). Referring back to the last statement of the test we assert that the return value of the call to taskCellWithTitle is not null – in other words we assert that a cell with the title matching that of the task exists. In our first test we verified that tasks could be added to the list, the next logical step is to test that they can be removed. To test this behaviour we need to firstly ensure that a task exists – to make things simple we will use the task that has just been added in the previous test. We then need to simulate the user interactions required to delete the task, in the MyTasks app we use the swipe-to-delete gesture to do so. A reference to the cell with the title matching the parameter is obtained. The cell’s ‘Delete’ button is obtained using the withPredicate method inherited from UIAElement. Here our predicate matches elements whose name contains the string ‘Confirm Deletion’ – which is the default accessibility label for table view cell delete buttons (for more information on predicates refer to Apple’s Predicate Programming Guide). The cell’s ‘Delete’ button is tapped and the task is removed. Referring back to the test the last line performs an assertion using tuneup’s assertNull method. This is effectively the reverse of the check that we performed in our first test. This time we want to assert that no UITableViewCell exists with a name matching the task title – hence we assert that the taskCellWithIdentifier helper method returns null. By now you should be seeing a pattern, our tests are deliberately short and rely on helper methods to perform much of the simulated interactions. Here we again use the addTaskWithTile helper method to add a new task to the list. We then use tuneup’s assertEquals method to verify that the first UITableViewCell in the task table has a title which matches the newly added task. The final test that we will write is more lengthy as it involves some complex UI interactions. In this test we want to verify that a user cannot add a task with an empty title. In terms of UI interactions we want to assert that when the user leaves the task title field blank that a UIAlert is displayed and no new task (with an empty title) is added to the table. UIATarget’s alert handler is set. 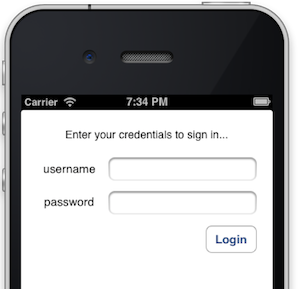 This function is invoked when a UIAlert is presented on screen – i.e. it wont be invokved immediately, it is a callback function. Next we attempt to trigger the alert by adding a task with a blank title using the addTaskWithTitle helper method. If everything goes to plan an alert will be displayed on screen, our alert handler function will be invoked and the didShowAlert flag will be set to true. This wont all happen immediately however so we give the simulator a short delay of 2 seconds using UIATarget’s delay method. 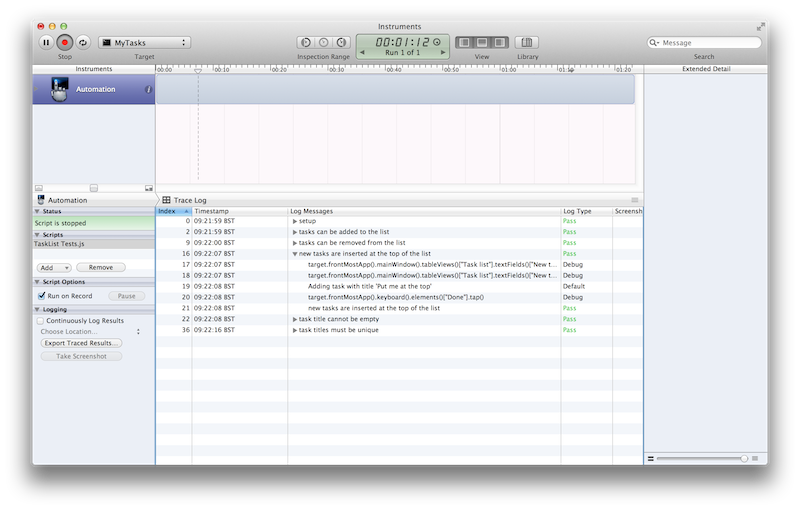 We then use tuneup’s assertTrue method to verify that the alert handler was invoked. Then lastly we use the assertNull method in combination with the taskCellWithTitle helper to ensure that a task with an empty title was not added to the list. I am delighted to announce that TripNI has now been released on the Apple App store and is available as a free download. For more information on the app head over to tripni.co. As a developer I love to makes peoples’ lives easier. In particular I am fascinated by how ‘smartphones’ can offer new opportunities to enhance how we interact with the world. One such opportunity is the ability to change how we travel and find our way around. Which is why I’m extremely excited to finally talk about TripNI – a mobile app which aims to help public transport user’s in Northern Ireland utilise our bus and rail services. TripNI will initially be launched for iOS devices (iPhone, iPod Touch and iPad) – with an Android version to follow. If you would be interested in testing the app in the coming weeks then feel free to sign up as a tester. A side-effect of developing apps over a long period of time is that you begin to see common problems that must be solved in numerous apps. Describing dates is just one such example. When I wrote my first app Simple2Do I needed a way to desribe to user’s when an item from their to-do list was due. I found the most comprehendible way to achieve this was to describe the time to/from the task in a single unit – i.e. the number of hours, minutes, seconds, days, months or years until the task was due. Fast forward a couple of projects and I began work on a Twitter client which displayed the user’s timeline. Again I wanted an easy way for the user to visualise when something happened, in this case when a tweet appeared in their timeline. The second time I encountered this problem I decided to code up a little utility class for creating these descriptions. The result was RelativeDateDescriptor, an objective-c utility class for producing human readable descriptions of date intervals which is now available open-license on Gitub. To check out the project head over to the GitHub repository, or if you’d like to find out a little more check out the readme.